Reading has proven to help children in many areas of their developing lives. Not only does it promote literacy and future learning, but it has shown to aid kids when approaching major milestones in their young lives. Just released is a new Potty Hero personalized book that helps kids ease into potty training by showing how their book persona can heroically save the day and be a big kid. By inserting kids’ faces into their own personalized books, they can more easily see themselves accomplishing the great things they read about in books and see in the programs they watch. This not only allows kids to better imagine themselves as great, but helps makes these ideas a reality, helping boost their self-esteem and instilling a positive self-image. Kids face a lot of big changes in a small span of time: potty training, preschool, learning to read and write, all major things that they will use later in life to be successful. Using books, especially personalized photo books, can help familiarize children with these big steps and help them better imagine themselves overcoming them with ease. Studies show that when reading about the personal milestone a child is facing, can enhance the learning process, and making it personalized will captivate children in wanting to learn because they become the STAR of their very own potty training story. 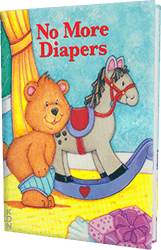 We also carry other personalized books about potty training that does not have the child’s photo but has personalized information. 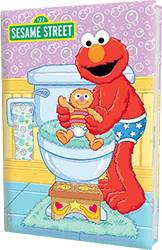 Elmo Bye Bye Diapers and No More Diapers teaches bathroom etiquette and reflects on the feelings that the child may be experiencing while encouraging them to take the next step.